Kiwifruit is a wonderful fruit of ancient China and was introduced to the western world in the starting of the 20th century. Kiwifruit is also known as Chinese gooseberry. It is full of vitamins particularly rich in vitamin C and minerals. I came to know about Kiwifruit recently, and was searching this fruit to taste it. I luckily got this fruit from supermarket. 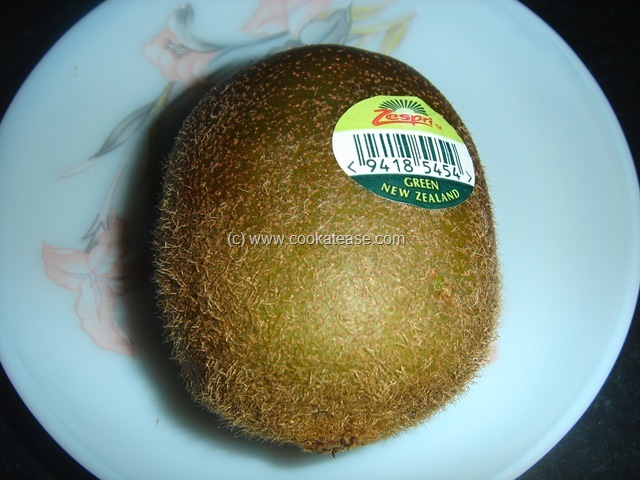 Kiwifruit looks different in colour, oval shaped with hairy brown skin. It is soft, green inside with black seeds and tastes sweet and mild sour. I prefer to use fruits without cooking to retain vitamins and natural flavour. Therefore, I tried kiwifruit crush adapted to Indian taste. Kiwifruit is also shown separately for clarity. 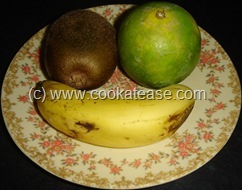 Wash and cut kiwifruit and banana; take out juice from sweet lime. In a blender put kiwifruit, banana, sugar and blend it to a smooth paste; then add sweet lime juice, honey, ice cubes and run the blender for few seconds. You get a wonderful kiwi crush. 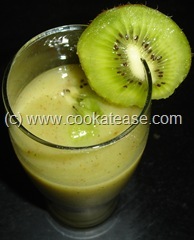 Pour in tall glass, garnish with kiwifruit slice/pieces and serve. This post is part of A Fruit A Month (AFAM) Event hosted by Padmajha Suresh of Seduce Your Tastebuds and scheduled by Maheswari of Beyond The Usual. 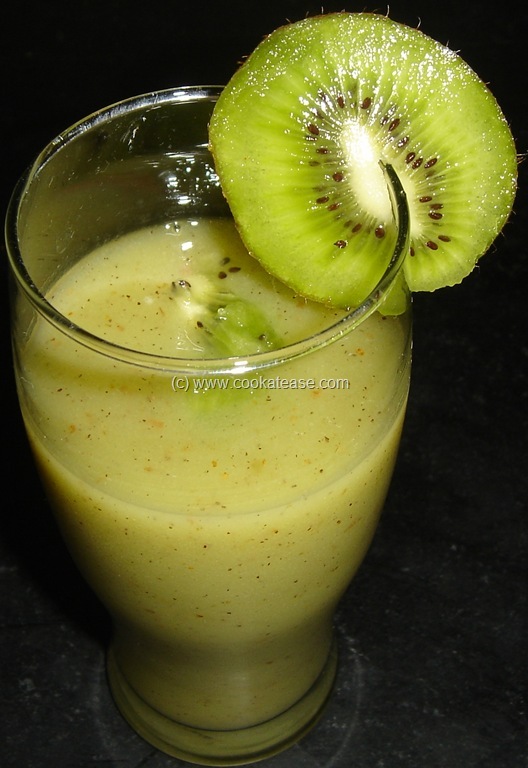 Just love kiwi, kiwi crush looks simply superb..feel like finishing the glass..
ur pictures r really good,tempting us 2 try ur recipes immediately.Congrats for ur wonderful posts.